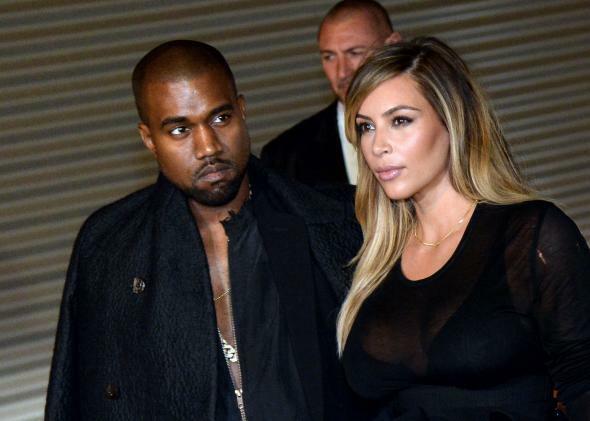 Kanye West, glowering, with wife Kim Kardashian. It may be tempting to laugh this off as the colorfully paranoid rambling of an artist known for his eccentricities. But here’s the thing: In this case, Kanye is being pretty reasonable. There are two separate issues to consider: the reality of celebrity-stalking drones, and the chances that a downed quadricopter might actually electrocute anybody. On the first front, Kanye is totally right to fret. As TMZ itself has reported, today’s paparazzi do in fact use drones to get images of stars (and their real estate). Miley Cyrus once took video of a drone circling over her home. Inside Edition notes that the aerial devices have been used to shoot Anne Hathaway’s wedding and Rihanna’s house. It seems to be a real enough issue that a California state senator introduced a bill to outlaw the practice. As for safety: Sometimes, drones do fall from the sky. It can be human error. It can be a technological malfunction. But it happens. Just this week, some knuckleheaded tourist crashed a camera-loaded drone into Yellowstone Park’s biggest hot spring, “possibly damaging the prized geothermal feature,” according to Reuters. I’m sure paparazzi spend lots of time honing their skills as drone pilots. But mistakes happen. Now, in the instance that a drone spiraled into Kanye’s pool while his daughter was swimming, would it actually electrocute her? It seems pretty unlikely, given that even if the battery was still generating electricity post crash, it wouldn’t be all that much current. That said, if a drone did manage to actually fall on his daughter from 300 feet above, it would certainly cause some physical injury. And while we might be talking about a very low-probability event here, it’s not a zero probability event. Which, if you think about it, is sort of crazy. And when it comes to the bigger picture issue West is concerned about, the invasion of his personal privacy, nothing he said is really that strange at all. In short, celebrities are not just like us. These days, they really do have to worry about drones falling around their houses.